The concept of the Diver flare came to mind in more than a few circumstances. As a former Royal Engineer diver who was involved in a couple of on surface incidents I would have loved to of had this unit. The simple fact that you were attached to a rope, and on the shore or boat a competent buddy or supervisor could haul you to the boat or jetty was a massive peace of mind. It was when my daughter and I were diving in the Red Sea of Hurghada on Light House Reef, we surfaced after a pretty fast drift dive to find the weather had deteriorated and no dive boat in sight! With the rolling swell our dive guide put up a S.M.B. to absolutely no use what-so-ever. The swell was bigger than the height of it! The group consisted of 8 divers, and after about ten minutes panic was starting to set in in a few people. With my experience I offered my idea of swimming over the reef where at least the water was not so deep. At the time we were over the drop off below us and getting drawn out to deeper water, so we all started to swim over the reef keeping together as best we could. After a pretty hard 15 minute swim, we halted got in to a circle and started to look around we spotted the boat about 25-30m away. We shouted and screamed and just by chance we were seen by a boat handler on the front of the dive boat and they made there way to us and picked up some very weary divers. On reflection later myself and my daughter were talking about the incident, it was at this time that a group of British divers in Bali went missing and were recovered about a week later on a remote island; sun-burnt and dehydrated. We agreed that if we had had a flare of some description and also had the Bali divers had one, we and they could have signaled the boat. We certainly would not have had the exhausting swim. So the concept of Diver Flare was born! Diver Flare enclosure complies with BS EN 60529; 1992, IPX8. 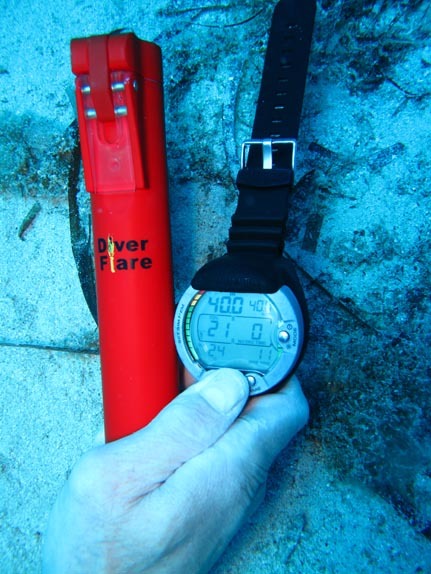 UPDATE Originally tested to a depth of 40m ,Diver Flare has now been successfully tested to 100m depth, please see our 'News' section for more information and test report. Diver Flare is manufactured for RH Activity and Marine Survival Ltd., U.K. and holds the UK Patent Number of GB0823314.0. Flares supplied by Pains Wessex. Red hand held Mk 8. Item No. 52900. Flares have a three year expiry date and will be required to be replaced on reaching this date. 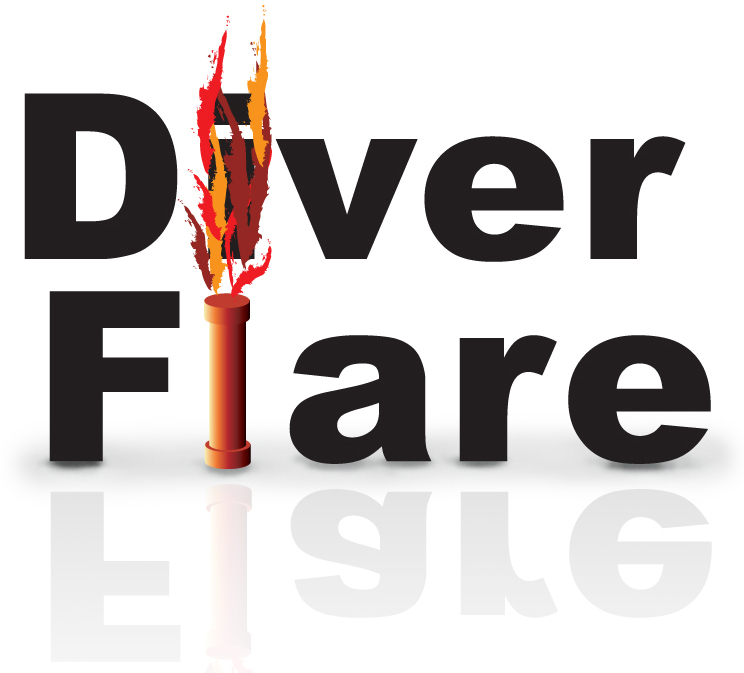 Diver Flare is a pyrotechnic device and should be treated as such and kept out of the reach of children and away from naked flames. The makers and suppliers of this product hold no responsibility for misuse of this product. After every use it is recommended to wash the enclosure in fresh water. This product when loaded with the flare is not permitted on any passenger aircraft, and if required to be transported the flare needs to be withdrawn from the enclosure and not taken on the aircraft.